Former Manchester City and Newcastle midfielder Joey Barton is making a pretty decent fist of his first managerial job after being appointed at Fleetwood boss back in April. Barton used his contacts well in the summer, bringing in some high profile players to the Highbury Stadium, such as winger Ross Wallace from Sheffield Wednesday, experienced Wigan defender Craig Morgan and former Spurs, Hull and Burnley midfielder Dean Marney, plus Ched Evans on loan from Sheffield United. The Cod Army made an impressive start under his stewardship too, as although Barton suffered defeat, 1-0 at home to AFC Wimbledon first up, they beat Oxford 2-0, drew with Rochdale, before the most eye-catching result of his reign thus far, a 5-0 thumping of Scunthorpe on the road. A draw with Charlton followed, while Fleetwood’s Carabao Cup participation was ended by Leicester 4-0, they recovered with a 2-1 win over Bradford and points Sunderland and Accrington saw them suffer just one defeat from eight, sitting in eighth place on September 16. Although they then lost two in a row and drew with Wycombe, Barton’s side once again showed they are capable of the spectacular on the round, leaving Doncaster with a sparkling 4-0 victory in early October. They also beat Shrewsbury 2-1, but since then life has become that bit harder, as the Cod Army lost 1-0 at both Portsmouth and Peterborough. They saw off Alfreton with ease in the FA Cup, but the victory over Blackpool was their only league success from six matches, defeats to Gillingham and Plymouth thrown in too. However, Coventry were put to the sword 3-0 while Guiseley were beaten 2-1 in the cup last weekend to set up a third round home tie with AFC Wimbledon, as Fleetwood sit 12th place, just seven points adrift of the top six. Off the pitch, the club also confirmed this week that technical director Grétar Steinsson has left his role at the club to join Premier League side Everton where he will be new Chief European Scout. Team news: Luton’s Alan McCormack is the only absentee for the game, with the midfielder sidelined due to a calf injury. Fleetwood don’t have any major concerns ahead of their trip to Bedfordshire. Top scorers: Hatters – Elliot Lee (10). Fleetwood – Paddy Madden (10). Man in the middle: Nicholas Kinseley - taken 12 games so far this term, showing 33 yellows and two reds. Yet to officiate Luton, although had the Hatter twice last campaign, the 7-0 win over Cambridge and 4-2 success against Lincoln, sending off Alan Sheehan on four minutes and then the visitors’ Harry Anderson nine minutes before half time. Refereed Luton twice in the 2016-17 season, the 1-1 home draws against Crewe and Yeovil, while also had two games the season before that, 2-1 wins over Crawley and Leyton Orient, showing former striker Jack Marriott red for a gesture made towards the away fans. 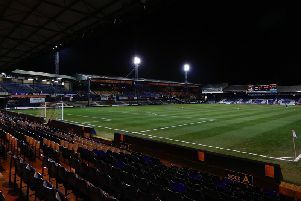 Took eight more Luton games during their Conference years, including the 6-0 win over Kidderminster and 5-0 thumping of Kettering, plus a 4-3 victory over Halifax, dismissing Alex Lawless against Forest Green Rovers in February 2013. In charge: Joey Barton – 36-year-old who had a rather controversial playing career to say the least after starting life with Manchester City. Made more then 150 appearances for the Sky Blues, winning an England cap in February 2007, joining Newcastle for £5.8m in July of that year. Spent four years with the Tynesiders, heading to QPR in August 2011 and had a loan spell with Marseille in 2012. Signed a one year deal with Burnley in 2015, helping the Clarets win promotion to the Premier League, heading to Rangers in May 2016. Was banned from football after admitting an Football Association charge relating to betting in April 2017, but when that expired, made an immediate return to the game, named manager of Fleetwood in June this year. View from the opposition: Joey Barton talking to the club’s official website: “We’ve flipped now to play Luton away on Saturday, who have the best home record in our division. “They’ve turned their stadium into a tough place for visiting teams to go so that’s another challenge we’ve got. “We’re looking forward to it. I think our group now, they’ve stood up to everything that has been thrown at them. “Whether it’s the physicality in the set-pieces and long throws that Guiseley did, or whether it’s that sharp and incisive play that Coventry have. Played for both: Steve McNulty – defender spent his early days with Liverpoool’s academy, before spells at Burscough, Vauxhall Motors and then Fleetwood when they were a Conference North side, joining for a then club record fee of £17,000 in August 2009. Captained the Cod Army to promotion and then the Conference title in 2011-12, finishing five points clear of Wrexham. Dropped back into the Conference to sign for Hatters under former manager Paul Buckle in January 2013 on a free transfer and swiftly became a cult hero at Kenilworth Road. Scored a goal to remember against Southport, while he played a leading role as Luton won their place in the Football League back with another champions medal. Played 125 times, netting twice, before he joined Tranmere on loan in October 2015 to be closer to his family, soon making the move permanent. Won another promotion to the Football League via the play-offs last season and now 35, has racked almost 150 appearances. One to watch: Paddy Madden. 28-year-old striker began at Bohemians in Ireland and then went Carlisle and Yeovil, before signing for Scunthorpe in January 2014. Played almost 200 times for the Iron, scoring 60 goals, as Fleetwood splashed out 150k for him in January of this year. Has repaid them so far, with 10 goals this term making it 16 in 42 matches for his new club. We’ve got form: Luton have never beaten Fleetwood at home in their history, albeit the two sides have met just twice at Kenilworth Road. The first contest saw the visitors win 3-1, with Lloyd Owusu putting Town in front early on, but Gareth Seddon levelled and then he and Anthony Barry’s quickfire second half double proved enough. Luton are yet to taste defeat at the Cod Army though, winning both matches 2-0 and 3-0. Last time out: Luton went down to a 2-1 defeat at home to Fleetwood in their last clash at Kenilworth Road, a Conference clash in November 2011. Leicester and England star Jamie Vardy opened the scoring on 11 minutes for a visiting team contained Steve McNulty, with Jamie Milligan’s penalty making it 2-0 on 67. Janos Kovacs pulled one back in stoppage time, but it wasn’t enough for Town to salvage a point. Hatters: Mark Tyler, Curtis Osano, George Pilkington, Janos Kovacs, Keith Keane, Alex Lawless (Adam Watkins 76), Robbie Willmott (Tommy Wright 58), Jake Howells, Amari Morgan-Smith, Stuart Fleetwood, Aaron O’Connor (John-Paul Kissock 70). Subs not used: Kevin Pilkington, Jamie Hand.